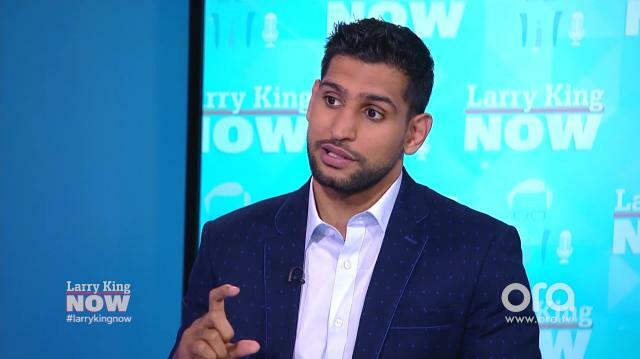 British boxer Amir Khan tells Larry he feels there's an anti-Muslim sentiment in Western civilization due to the recent swath of terrorist attacks in Great Britain carried out by extremists. The former WBA champ also divulges that he's been called a "terrorist" due to his ethnicity and religious beliefs. Amir Khan:-- To kill these innocent people. So, I just think that whoever’s doing this...They’re not Muslims. I don’t call them Muslims. Larry King: How do you feel, being a Muslim, about the anti-muslim feeling - even the President of the United States has expressed a degree of anger at Muslim activity. How do you feel? There is an anti-muslim feeling in the world. Amir Khan: There is, there is and you know, you ask...It does put that fear in you, obviously. My daughter is going to grow up one day. I never want her to walk down the street and people are calling her a terrorist. I mean, it’s even happened to me on social media. I’m more British than anyone, I represented Great Britain in the Olympics, I won a medal for Great Britain, and people are calling me a terrorist because I’m a Muslim….and...you know, it’s a very tough time that we’re living through at the moment, but what needs to happen is, all the communities need to get together. All the Muslim communities need to get together and they need to send that message across the world, being Muslim: that we are all against terrorism.